at Tuesday, July 01, 2014 Posted by Tony N.
I have wanted to say something for a while now about what I thought the Bill Lazor hiring was going to do for this Dolphins team. But moving 300 miles and health issues have prevented me from doing so. Seeing Patrick Tarell's recent article on Lazor motivated my writing this piece so if you don't like it, take it up with him. (Joking of course, Pat). I had a bunch of facts and figures accumulated about Lazor. From his short stint with the Eagles. His previous pro and college coaching history, all the way back to his college years as a quarter back at Cornell University. Seems I have lost some of the research in the move, so I'm not going to try to bore you with too many stats and info that only offer possibilities and tendencies, anyway. Like Patrick said, it appears Miami decided to break away from their previous practice which mandated going with an OC that had plenty of game film and history, which brought us the likes of Henning and Sherman in recent years. We took a chance on a relative unknown to try and shake thing up, so to speak. Tannehill has done well to make the improvements he has last year with a poor offensive line, below average running game and a OC that could no longer stay on top of the game, adjust to changing circumstances or further develop Ryan's skill set to take him to the next level. Enter Bill Lazor. And just when we were looking for someone who could jump start our Plain Jane, predictable offense, too. Someone who could also get our QB to make better decisions, develop a stronger sense of pocket awareness and hone his ball skills. (The long ball in particular)! 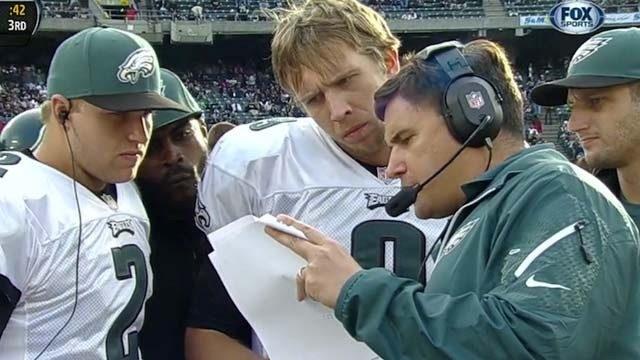 Judging from his history as an OC and more importantly, a QB Coach, he has demonstrated a unique capacity to make the best use of the talent he has to work with and elevate quarter back play in a very short period of time. He fulfills both needs, very well. Christ. The guy has a Bachelor's Degree of Science in Human Development and Family Studies? I don't know what all that degree stuff means but he obviously has an ability to communicate, break things down to a rudimentary level that makes it easier for others to learn and understand. His contributions in a single season to a Philadelphia Eagles second year QB, Nick Foles were nothing short of miraculous. I know some of you may be thinking, but what does his one year success with the Eagles mean for us? Just because the Eagles went to the playoffs their first year under Chip Kelly's fast paced, exceptionally well balanced offense doesn't mean we are destined to do the same. Besides, Philadelphia was already trending in that direction anyway, right? NO! A few quick facts and figures from NFL.com to consider: (Mind you I'm talking about their 2012 figures versus our 2013 as a reference point to show the state of both offenses before Bill Lazor came to the franchise). The Eagles in 2012 were a middle of the pack team that scored only 280 points. Overall offensively, they were ranked 16th. Ran 1,079 plays, averaging 5.3 yards per play. Had 37 fumbles, (22 of which they lost) and a Take Away of -24. Passing, they were ranked 13th. (We were ranked 26th). This was the passing attack Bill Lazor inherited. He also had Michael Vick for a QB, too. Rushing, they were ranked 13th as well. (We were ranked 17th). 413 attempts for 1,879 yards and a 4.5 yard average. In his 20 years of coaching, (12 at the College level and 8 with NFL teams) Bill Lazor has immediately improved the QB play, (12 years as a QB Coach) or total team offensive performance, (5 years as an OC) with every organization he has been with. He has also coached up RB's, TE's, WR's and even did a little recruiting early on in his career. (This last fact tells me he should know a little something about spotting and developing player talent). Why do I think he is going to make dramatic improvements with the Dolphins? Well, for one, we have a lot of room to get better. (More so than the Eagles, anyway). I know that sounds kind of lame. In most statistical categories they were a better offensive team in 2012 than we were in 2013. We did score more points (317 vs their 280) had fewer turn overs, (-2 vs. -24 in T. O. 's) and a slightly higher passing game rating, (80.1 vs. 78.6). We only threw for 204 fewer yards and 439 less rushing yards on the season, too. An area of concern was the ratio of passing to rushing plays for us in 2013. It was a woeful 65/35% split. We threw 593 plays to their 618, and ran only 349 times while they tried to run significantly more at 413. Neither of us were balanced in our attack, at all. Something opposing defenses were able to key on as both our clubs suffered an inordinate amount of sacks. 58 for us and 48 for them. An interesting side note: Despite their have a balanced attack in 2013 they still gave up 46 sacks which means they too, were having pass protection issues. What is more amazing is that they still wound up with an incredible overall TD to INT ratio of 39 to 9. And since their veteran QB Michael Vick went down to injury early on, Nick Foles played the bulk of season, sustaining 28 of those sacks and still tossed an unbelievable 27 TD's to a measly 2 INT's. (Due to Lazor's tutelage and having the league’s best running game to help take the heat off of him). Bill was able to take a second year QB and help him achieve unheard results on the field of play. What makes me think he can do, at least, an equally masterful job with Tannehill? For one thing Ryan is entering his third NFL season, (while Foles was in his second year when Lazor got a hold of him). Production-wise, Tannehill actually cracked the top ten QB's in the league last year. In 2012 Foley was ranked 40th, Vick was 27th. Ryan Tannehill was ranked 22nd his first year out of the gate. (which is exactly what Foles was able to do in under Lazor in 2013). So Nick Foles went from 40th to 22nd while Tannehill went from 22nd to 10th in their respective first two years with the NFL. All in all, I think Ryan is a tougher, more athletic QB than Foles. I'm sure Lazor will utilize his running skills to our advantage, as well. He is a better prospect to work with than Foles, has more Pro experience under his belt, (much of it being pressured, hit and sacked) and shouldn't take too much more mentoring to get him over the top and have a breakout season. Sure Bill Lazor is an OC, not a QB Coach anymore, but you can bet he will have some impact on Tannehill's performance in his third year with the club. And since Bill has been given a free reign as the OC, (one of the conditions of his coming to us) he can better build and create an offense around our QB that will be more productive. He is sure to bring some of his experience with Chip Kelly's fast paced offense. He is well versed in the type of West Coast Offense Joe Philbin wants to run. He will have a better offensive line that has some solid pieces now to pass protect and do a better job of opening up holes (zone blocking) than he did in Philly. Our receivers and ball carriers should be on par with what the Eagles had on their squad. (Especially the receiving corps). Bill Lazor is young, hungry, original and creative. He has played under some top notch Coaches over the years and has a superb grasp of the game. (Especially the QB position). More so than most OC's in the league. He is out to prove something now that he has been given an opportunity to be an OC. So far, it seems like Miami's offensive players are happy and excited with the style of offense Bill wants to install this season. This will be the first time he will be calling the offensive plays in his career, too. As many years as Philbin was an Offensive Coordinator for Green Bay, he never called his own plays, either. (I see this as another bonus since defenses will not have any prior history to draw upon). It beats the devil out of the, "Go Go" counts and stock formations that were etched in stone and easily readable by defenses, last season. An up tempo, unpredictable offense that moves its players around to create confusion and mismatches will have a better chance to dictate to the defense instead of taking what the defense gives them. It would be nice to see a high flying, potent offense taking the field this year. This team is overdue for some offensive football excitement. And I mean some really obscene offensive football, too! We already have a defense that is capable of creating turn overs and stopping people. (When they aren't forced to be on the field for extended periods of time because the offense cannot hang onto the ball, sustain drives or generate points). A stronger offense will only improve the defense's level of play, too. They say we have a brutal schedule again this year. They said the same thing last year when we opened the season against three playoff caliber teams and went 3 and 0. We beat the Colts, Bengals, Chargers and Steelers. (All of which were potential playoff teams). One more win would have gotten us to the post season arena. Chip Kelly and his OC will get most of the credit for the Eagles sudden offensive turn around. But nothing was more impressive than what Nick Foles, (with Bill Lazor's guidance) did to wind up with a 119.2 passer rating and a ratio of 27 TD's to 2 INT's during his 11 game stint. I believe a couple of more wins in 2014 will get us into the playoffs, for sure. It is entirely possible if we can manage to score an average of 5 more points per game. (Remember, 9 of the 12 teams that went into the post season in 2013 scored 400 points or more to get there). If the Eagles can go from 280 points in 2012 to 442 points in 2013, we should be able to go from 317 to around 400. That is all it will take for Miami to be relevant again folks. Glad we got Mr. Lazor on our side to help make that happen.